"Size doesn't matter" when it comes to wizards. His left hand holds the leash of his pet dragon that peeks around his robe. His right hand holds his staff of power. 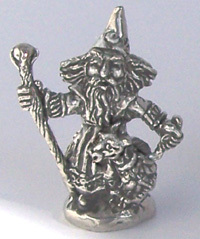 We make him by hand from lead-free pewter.